Just Where Is Cyprus Exactly? The question is often asked, where is Cyprus exactly. Well a lot of people seem to think it is one of the greek islands but let me tell you, no self respecting greek cypriot would agree with you there. In answer to the question, they will reply very strongly they are not part of Greece and they have their own identity. This lovely little island is closer as the crow flies to the Middle East than it is to mainland Greece. 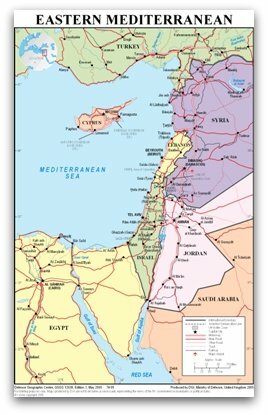 As you will see from the map above, it neighbours Turkey to the north, Syria, Lebanon, Israel and Egypt to the east and south. If you take a boat from the port of Limassol in the evening you can be in Haifa in Israel for breakfast, or fly to Cairo in Egypt in about an hour or so from Larnaca Airport. The Island is a great centrally located place to make a base if you want to travel to the Middle East. There are many flights & tours daily from the airport to Middle Eastern capital cities such as Jerusalem in Israel, Amman in Jordan, Damascus in Syria, Beirut in Lebanon. You won't though be able to fly to Turkey though, from Larnaca because of the long history of occupation in the North of Cyprus. You can fly from Ercan in the North or from the south if you want to go there you have to go by boat to Rhodes and then travel onwards or fly to another city and then take a further flight. Many people who work in the Middle East come to Cyprus for their rest and recuperation time, and many people own holiday homes here specifically for that reason.